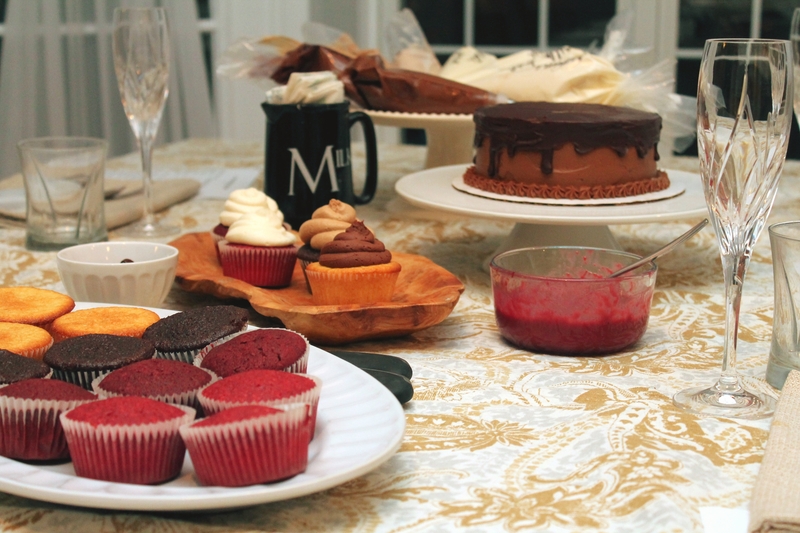 Much like the last time I made a wedding cake, I started out the whole adventure by hosting a grand cake tasting! This was no small wedding. The bride and groom had over 20 attendants in total, and there were 200 guests to celebrate with them! Before we even got started with cake tasting or design planning, they let me know that they wanted to have a tiered bride’s cake as well as a groom’s cake. Both cakes were going to be on display at the reception. The bride and groom both like chocolate cake—although, in the groom’s case, “chocolate cake” actually means yellow cake with chocolate frosting. The bride initially indicated that she was interested in red velvet cake, for the wow factor and pop of bright color upon cutting into it, but she also asked to try something mocha. We both agreed on buttercream frosting rather than fondant to cover the cake, because flavor is the most important part of a cake! I made two different yellow cakes and two different chocolate frostings for the groom to choose from, as well as a dark chocolate ganache for the cake filling. For the bride’s cake, I made two different shades of red velvet cake, as well as a rich chocolate cake. Red velvet cake is traditionally paired with either cream cheese frosting or ermine/boiled flour frosting, but I made a few variations and flavors for her to choose from. I felt pretty confident that she was aiming for red velvet inside and a bright white frosting on the outside of her cake! But she had also specifically mentioned mocha as her favorite flavor. I knew there was no way to make a white mocha frosting, but I played with the amounts of espresso and chocolate to create a few different shades of frosting to go with the chocolate cake. At the last second, I also added an espresso frosting to the lineup, because chocolate + espresso = mocha (and after making 11 other frostings and buttercreams for sampling, clearly I wasn’t interested in restraint…). 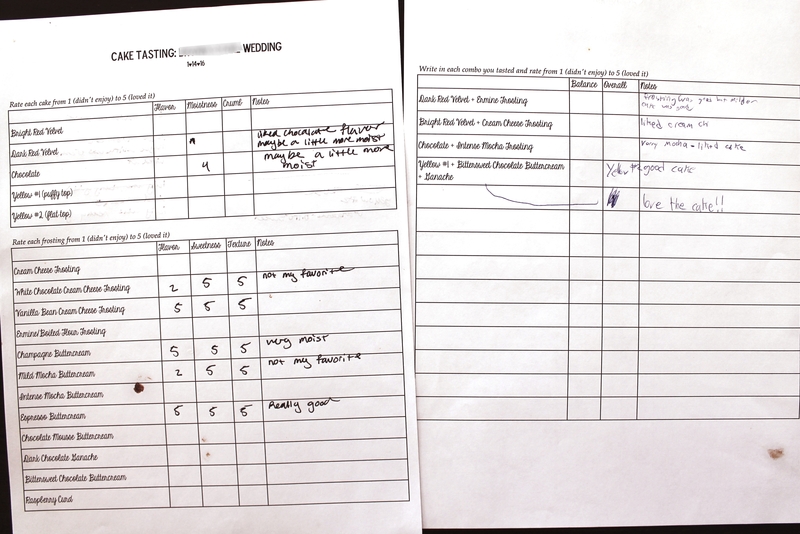 Like the first time I did the wedding cake thing, I made a little feedback form for the bride, groom, and her parents so they could collect their thoughts as they tasted. I told them to be as critical as possible, so that they’d be able to choose their favorites and know why they chose them, and so that I’d be able to use their feedback to make the cakes as delicious as possible for the Big Day. Much to my surprise, the bride chose the chocolate cake with espresso frosting over red velvet! Flavor is king. Once the bride decided on a brown frosting for her cake (eep!) we had to figure out how to make the cake lovely and bridal. I had already suggested a two-tiered, dripping-ganache cake for the groom. I think that effect is so elegant and actually very simple to pull off! But we wanted to establish a contrast between the two cakes. Both cakes shouldn’t be brown! We wanted the bridal cake to stand tall, to glow like a bride. The bride had pinned a dozen images of absolutely gorgeous, fairy tale-worthy cakes: cakes with cascading flowers, cakes with elaborately piped and pressed designs, cakes surrounded by twinkle lights, cakes with pearls and ribbons and lacy strips of fondant. Let’s be honest. Most of the fancy cakes on Pinterest look so fancy, so smooth and perfect, because they make expert use of fondant. We went back and forth a little about whether to cover the espresso frosting with a white layer, either fondant or a pale buttercream. I very nervously examined all of the professionally decorated cakes, trying to determine what I could execute well. I wanted to give the bride her fairy tale! In the end, we decided on a three-tiered cake, espresso frosting in all its delicious glory, with white piping and sugar pearls for contrast. Luckily, two-tone cakes are very trendy…and even though most of those involve dyeing the frosting to go with the theme of the wedding, we had high hopes that this natural mocha cake would fit the fairy tale! Boy was it ever important for me to do a trial run of the bridal cake. I knew the bride had high expectations, and I had never created something so elaborate before. I bought foam cake forms to practice with, and I sketched designs to try. Eventually, I pulled out my cake pans and actually baked and frosted a whole three-tiered cake, two months before the wedding. I wanted to practice transporting the cake after it was assembled, which I had not done when I made my first wedding cake. 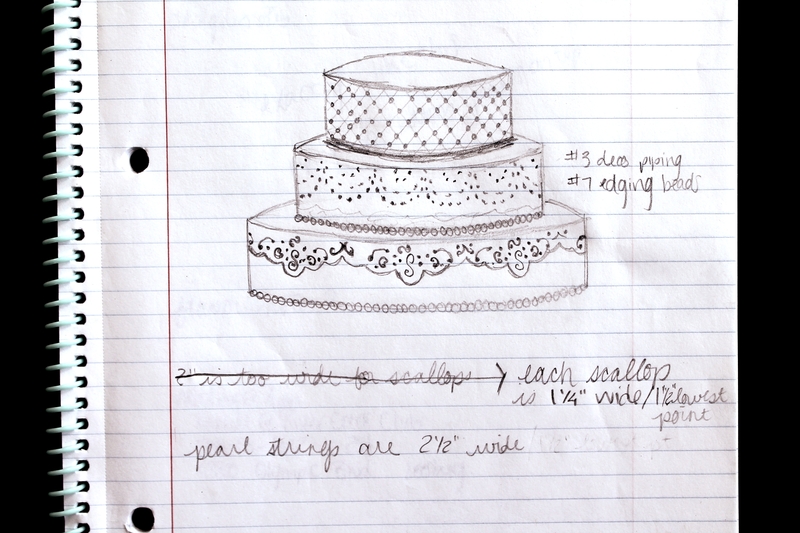 It might seem a little crazy to make an extra wedding cake, to go through that insane amount of effort twice. But don’t forget: I am still just a home baker! I have only done this wedding cake thing once before, and that had been a much simpler affair. I was trying to recreate fondant styling with buttercream, and I really wanted to give the bride a chance to make changes to the design. I actually made each tier a different height so the bride could decide how tall she wanted the tiers to be. 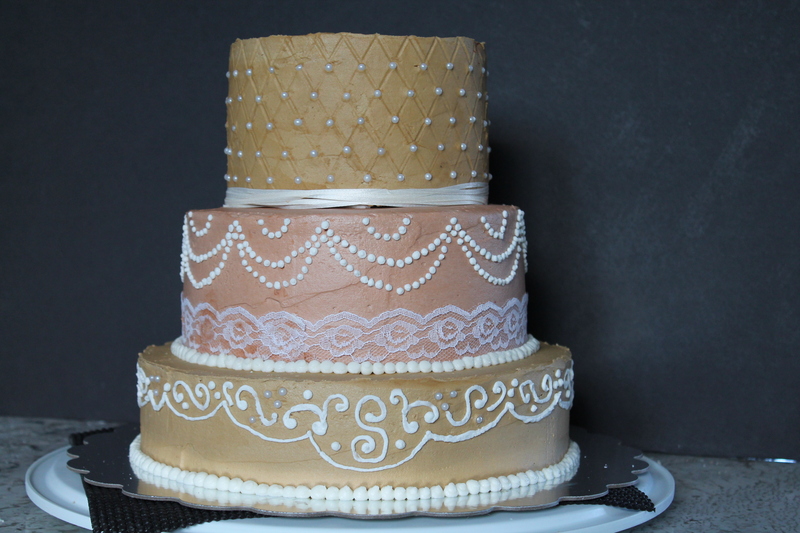 I also colored some of the frosting a dark pink (pink was the main color of this wedding), just in case she decided that the brown espresso frosting was too brown and wished for something more bridal. I was so relieved that the bride loved the trial cake! In fact, she loved it so much that she asked for the real wedding cake to be exactly the same. We nixed the pinkish frosting (but I’m still glad I tried it!) and decided to keep the different-height layers, which worked well with each tier’s different design. And…the cake was absolutely delicious! I also made a trial groom’s cake. This was totally about the yellow cake. Yellow cake is my nemesis. It’s also my favorite, so I might be an overly harsh critic. For some reason, I have always preferred box mix yellow cake (gasp!) over any from-scratch recipe I’ve come across. Yellow cakes are so finicky. They can easily become dry or rise unevenly. The recipes are usually much more complicated than those that have chocolate or fruit to balance the texture. The recipe that the groom selected was no exception, but it seemed to bake up moist, light, and richly vanilla. I just needed to make sure that was true no matter what size pan I used! Luckily, it baked well. The tops and edges seemed supple, and when I eventually cut into the cake to level it, the inside was moist and fragrant! I also wanted to test how well this yellow cake would maintain its moisture over time, because I knew that the real wedding week was going to be a huge feat of organization and delicate timing. I needed to know whether this cake would still be delicious if I frosted it a few days before the wedding (to give me time to frost and decorate the big kahuna). The groom and his family loved the cake! These trial cakes bolstered my confidence and experience level in such an important way! I am a realist: I knew making the two cakes and several sheet cakes all at the same time would be a tremendous amount of work. But after the successful trial cakes, I also knew I could pull it off! That assurance was definitely worth the extra effort of doing the whole thing twice. Even though I knew I could pull off the display cakes individually, I was pretty nervous about getting everything baked and frosted to perfection all at the same time. I never realized how much organization is involved in being a professional baker! The coordination and planning that go into producing a massive amount of anything, even something that is relatively easy to bake, is just impressive! I have a new respect for pastry chefs everywhere. I consulted a friend of mine who is a professional pastry chef to figure out a schedule leading up to the big day. Five days out from the wedding: I went grocery shopping. Because I don’t normally keep 10 pounds of butter and 6 dozen eggs on hand in my refrigerator. I had originally thought to make a few batches of frosting on this day, as well. Frosting can keep nearly forever in the fridge, and once you let it thaw completely, it will spread just the same as fresh frosting! I knew a big battle in making these cakes come together was actually just going to be dishes. I don’t live in a house with a commercial kitchen in it…so I don’t have commercial baking equipment that can handle large batches, or a paid dish washer to do my cleanup. But I panicked a little and ended up saving this job for Big Day Minus-4. Four days out from the wedding: I baked the chocolate sheet cakes (four batches of cake, which were later leveled and stacked to make two tall sheet cakes). This chocolate cake is moist and dense and I knew it would keep its moisture better than the yellow cake, which is why I made it first. I planned to wrap each of these in Press&Seal wrap and store them on the counter until I was ready to fill and frost them on Big Day Minus-2. This day I also made one batch of chocolate mousse buttercream and one batch of espresso buttercream, which I stored in the fridge until I was ready to use them on the sheet cakes. 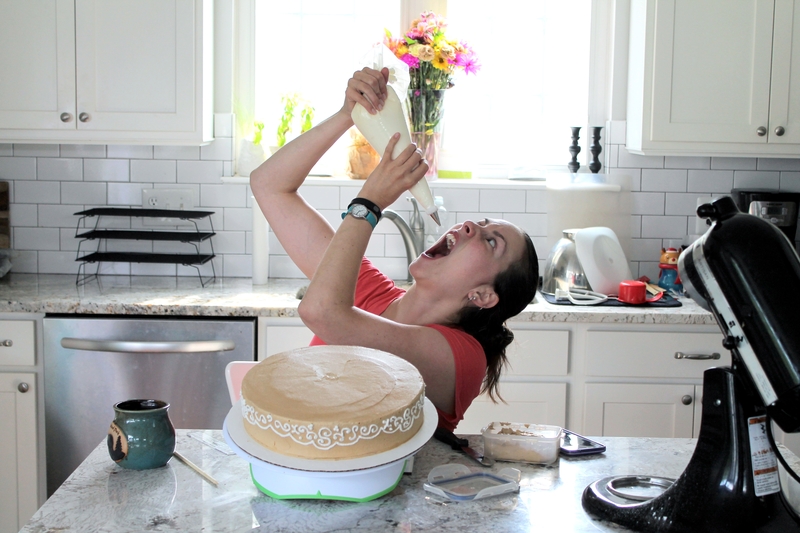 After I made the espresso buttercream, I got too excited (nervous?) to wait, so I went ahead and leveled, filled, and crumb-coated the chocolate sheet cakes. I then stored these, inside cake boxes, in my refrigerator until I was ready to finish frosting them on Big Day Minus-2. Three days out from the wedding: First, I panicked, because I had just learned that the place I had intended to store the large amounts of fancy cake I was baking (at our church, in the commercial fridge) was hosting an all-church picnic on Sunday, the Big Day. While there may still have been enough space at the church for my cakes to chill there, a large part of our congregation is Chinese, and the church picnics are always full of traditional, homemade Chinese foods! Um…but cake that smells like Chinese food seemed like a bad idea. Happily, I found a friend with refrigerator space to spare. God bless friends. On Big Day Minus-3, Sarah of Well Dined came over to play with my kiddos while I covered every inch of my counter space in cake. I baked the chocolate bridal cake, all three batches of it. I wrapped these layers tightly in Press&Seal after they were completely cool. I also baked three double batches of yellow cake, which composed the groom’s cake and the yellow sheet cakes. At one point, Sarah had to literally read the recipe to me because my brain had frozen. I wrapped all of the yellow cake in Press&Seal after it was cool, and kept the baked cakes on the counter. I felt so good at the end of this day! All the cake was baked! Two days out from the wedding: I made ganache and chocolate mousse buttercream and I frosted all of the yellow cake. For a big chunk of the day, a friend from church watched my darlings, and my house was empty and quiet. I had intended on this day to do all of the frosting, front-loading the work so that the last days would seem easier, but I was not feeling well—the pressure was starting to get to me. I filled, crumb-coated, and frosted the yellow sheet cakes. Then I did the same with the groom’s cake tiers, finishing off with the dripping ganache. I stacked the tiers of the groom’s cake and placed it safely inside a large, airtight cake keeper. All of these cakes went to the spare fridge space. At the end of the day, I managed to put the outer frosting on the (previously crumb coated) chocolate sheet cakes. But the bridal cakes remained untouched, wrapped on the counter. One day out from the wedding: I made lots of espresso buttercream, then I filled, frosted, and decorated the tiers of the bridal cake. This was definitely a big, scary day. This was the day I did the most visible work! My parents came to stay for the weekend to help with the kids (and listen as I ranted about logistical problems of delivery). Also, I finally had a dish washer, the most helpful kind of baking assistant! My mom washed every frosting-covered bowl and spatula. Bless her. I stored the decorated tiers of the bridal cake separately overnight, in airtight cake keepers. This seemed much safer to me, as it would prevent anyone accidentally dropping anything on them or knocking into them. Wedding day: On the wedding day, I stacked the tiers of the bridal cake and put on the finishing touches, such as the lace and ribbons, at home. I took two trips (with my mom) to transport the cakes. My goal was to deliver everything and finish setting up about two hours before the start of the reception (because I was invited to attend the ceremony, as well). During the first trip, I brought the groom’s cake and sheet cakes to the country club where the reception was taking place. I wanted to see the venue before I showed up with the bridal cake. Then we made a second trip with the bridal cake. Scariest drive of my life, including the day we brought Jake home from the hospital. At the wedding venue, I set the cake carefully on the metal cake plateau, did a few more finishing touches (ribbon, piping), and helped the amazing florist to create the cascade of silk flowers. And then I got to attend a wedding! I am so happy with how these cakes turned out! 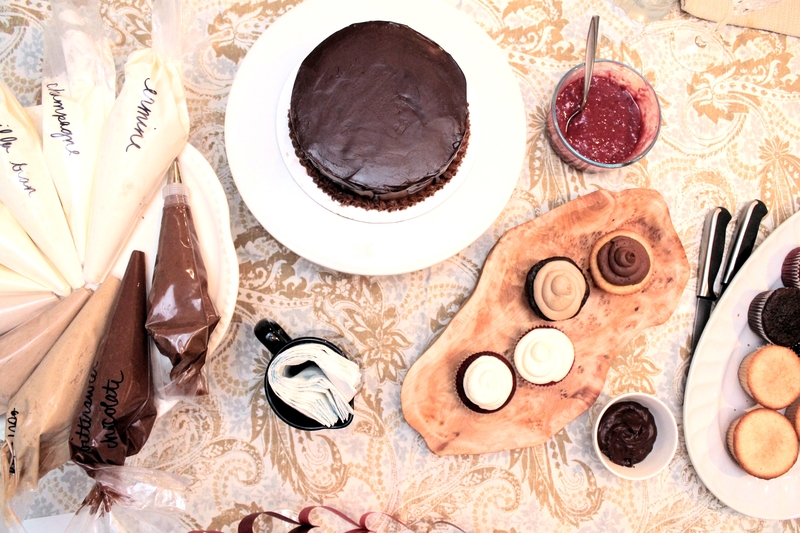 I will share how to make each cake combination—yellow cake with chocolate buttercream and ganache, and chocolate cake with espresso buttercream—and later, tips for transporting a tiered wedding cake!